The rose is believed to have originated in Iran (Persia) and Turkey, where it spread to northern India, the Middle East and to Ancient Greece before making its way into central and northern Europe. In North America, many native species exist and there is a history of traditional use of wild rose as a food and as a medicine. Rosehips were valued for their nutritive and tonic properties. According to the Canadian Wildlife Federation, rose pollen is a valuable food for insects such as bees, and rosehips are a valuable winter food for birds and mammals such as coyotes, skunks, squirrels, and bears. The rose petals and rosehips are used in jams, juices, syrups, soups, and desserts around the world. So enchanted have people become by the scent and beauty of the rose that many hybrids and cultivars exist today, mainly as ornamental plants that give a colourful flare to the garden landscape. Who could fail to be impressed by the sequential unfurling of this majestic flower or drawn to its unique fragrance? The wild rose though is a more humble plant, with fewer petals - often only five - and with an array of yellow pollen covered stamens emerging from their centres. Their colours range from pale to dark pink and they are always gently scented. I have found that the old homesteads around the Ottawa region and in the Gatineau Park often have wild roses growing nearby, alongside other medicinally useful plants. The rose has many uses. Its visual beauty alone is outstanding and indeed the pink and red rose have become synonymous with gestures of love. What would Valentine’s Day be without roses? In my practice I often add rose petals to a tea blend for sleeping or relaxation. A blend of rose, lavender and hibiscus, drunk as an infusion is especially effective at soothing and calming the mind. Traditionally, rose petals have been thought to soothe a broken heart and have a special place in both love and loss. Rose oil is mainly distilled from the petals of the damask rose (Rosa damascena). It can take around 30 roses to produce just 1 drop of this exquisite oil. The scent of rose is calming to the mind and can lift the spirits. There is some evidence that rose oil, (rose otto) along with lavender essential oil may reduce the risk of post partum depression. 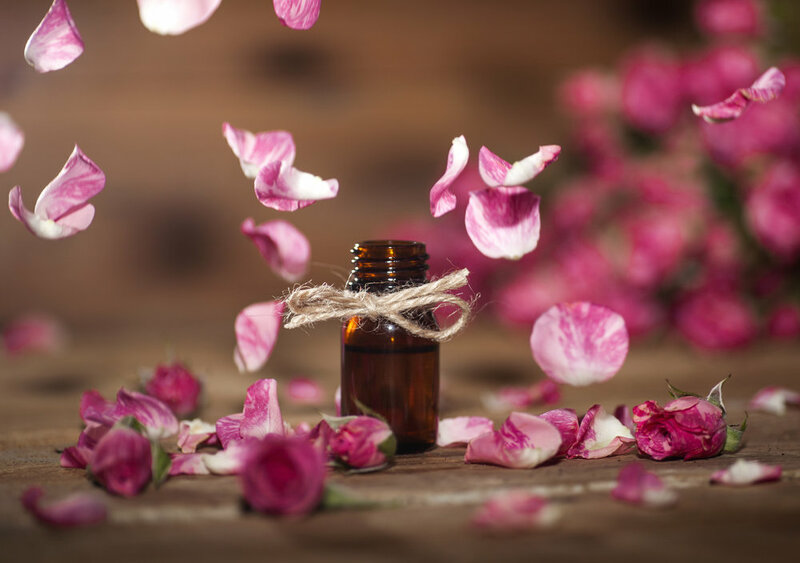 Rose oil is highly regarded in the world of perfume and is the most widely used oil in perfumes, which speaks to its allure. It is expensive and often sold in very small amounts. When rose oil is being distilled from the petals, the ‘steam’ captures some of the essence from the petals, this is what is known as rosewater. It is less often obtained from infusing the rose petals in water. Rosewater is used in religious ceremonies and as an ingredient in cooking across India and the Middle East. It lends its distinctive flavor to India’s kulfi ice cream and to Turkish Delight. Rosewater has cooling and astringent properties and is often used in herbal medicine for inflammation of the skin, especially on the face. Spritzing the face and neck with a little rosewater can be a useful strategy to cool the skin during a menopausal hot flash. The fruit of the rose, the rosehip, has a long history as a wild food and is used for many common ailments in various parts of the world. It is like a miniature apple, which is not surprising as the apple and the rose belong to the same family. The rosehip has been an important source of vitamin C at various periods in history. More northerly regions such as Alaska, Scotland and northern England produce rose hips with a higher vitamin C content, possibly as a result of the longer days of summer sunlight. An article published in 1942 confirmed rosehips as a rich source of vitamin C, in fact 10-12 times more vitamin C than oranges, when compared weight for weight. During World War II, with food rationing and little in the way of citrus fruit coming from abroad, there was a fear of vitamin C deficiency. In response, the British government set up a system where, by way of incentive, they paid people by the Ib, to forage in the hedgerows to collect rosehips. Various groups, including women’s institutes, school children and youth across the British Isles, participated and collected thousands of tons of rosehips, which were sent to a central processing facility. The rosehip syrup was produced and distributed throughout the UK especially to children to help improve immunity and prevent vitamin C deficiency. In Canada, rosehips were traditionally used to strengthen the immune system through the winter months and guard against colds and flu. There is a wonderful indigenous symbolic tale called ‘The Year the Roses Died’ within a beautifully written book called ‘Plants Have So Much To Give Us, All We Have To Do Is Ask’ by Mary Siisip Geniusz ,Wendy Makoons Geniusz and Annmarie Geniusz. It is worth a read if you are interested in the traditional use of herbs as medicine. Today, rosehips have a broader use beyond just their vitamin C content and recent research is reasserting its use in traditional medicine. They are a rich source of the phytonutrients - anthocyanins and polyphenols, which provide strong antioxidant and anti-inflammatory properties to help heal the body. There is some strong evidence that taking just 5g per day of a specially extracted rosehip powder may reduce joint inflammation and relieve some of the pain experienced with osteoarthritis. Emerging research suggests it may also reduce the inflammation and pain associated with rheumatoid arthritis. Unlike rose oil, which as mentioned, is distilled from the rose petals, rosehip oil is extracted from the flesh and little seeds within the bright red hip. Cold pressed extraction is the best as it preserves the quality and healing properties of the oil. The cold-pressed rosehip oil does not have the beautiful scent of roses but is a rich source of linoleic and alpha-linolenic acid, beta-carotene and vitamin E. These are essential to health and are partly responsible for the healing and anti-inflammatory properties of rosehip oil. he orange/yellow tones of rosehip oil suggest it’s deeper qualities. Rosehip oil is applied to the skin for its special anti-aging, skin-calming and healing properties, and is recommended for the management of acne, scars and stretch marks. Skin specialists recommend rosehip oil as a skin revitalizing agent that adds hydration and may improve the appearance of fine wrinkles. It is a very popular ingredient in natural skin care products. Below are two lovely recipes that you can make in your home. One of my favourite teas to sip is an infusion of rose hip, hibiscus and ginger. This can be drunk hot in winter and it makes a delicious summer iced drink with slices of lemon. Place the herbs in a strainer or strain from a teapot. Infuse the rose hips, hibiscus and ginger for 4-5 minutes in boiling water and strain. Enjoy when cool. 2. Bring to the boil and gently simmer for 15 minutes. 4. Add the lemon juice and sugar. 5. Bring to the boil again until all the sugar has dissolved. 7. Pour into sterilized jars and seal. 8. Good for one month when refrigerated. Enjoy this syrup drizzled over you favourite vanilla ice cream, added to boiling water as a tea or added to sparkling water as a refreshing drink. It can be a cooling drink in summer and a warming spicy treat in winter.